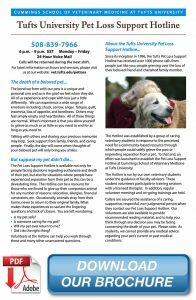 The Tufts University Pet Loss Support Hotline is a nonprofit organization dedicated to serving the community by helping people who are grieving for companion animals they have lost. Its operation has relied upon the financial support of private donors, including veterinary associations, private foundations, and pet-related industries. Your contribution will help support hotline operation, purchase staff training materials, and foster pet loss education. If you wish to make a donation, please fill out our contribution form. We appreciate your support.